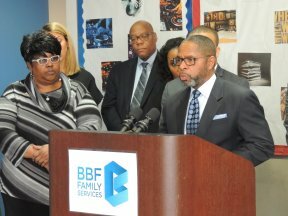 BBF Family Services (BBF), a community-based, human services organization located in North Lawndale hosted the kickoff of the Citywide Mental Health Response Steering Committee’s West Side Outreach Project last Thursday. 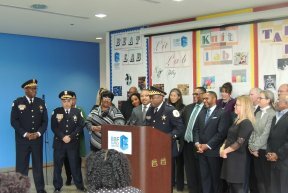 The pilot project provides free mental health training to schools, faith-based institutions and community organizations and was preceded by a detailed press conference. The National Alliance on Mental Illness (NAMI) Chicago’s Executive Director and Licensed Clinical Social Worker, Alexa James, presented the first training session to staff of various community organizations at the BBF Center on 1512 S. Pulaski Road. The training session focused on reducing stigma toward mental illness and providing productive, sensitive, and informed responses to mental health crisis. “In our communities, it is not post-traumatic stress disorder but traumatic stress disorder, every day, all the time,” said Rufus Williams, president and CEO of BBF Family Services. Dr. Julie Morita, Commissioner of the Chicago Department of Public Health (CDPH), stated that the city “is focused on expanding access to services” for mental health. Other representatives present included Chicago Police Department (CPD) District Commanders James Sanchez (10th), Kevin Johnson (11th), and Dwayne Betts (15th), 24th Ward Alderman Michael Scott, Jr., 29th Ward Alderman Christopher Taliaferro, Dr. Carolyn Vessel from I AM ABLE Center for Family Development, and Professor Amy Watson from the University of Illinois-Chicago (UIC) Jane Addams College of Social Work. The organization specializes in six program and service areas: Community Engagement, Education, Employment Services, Family Services, Health & Wellness, and Youth Services. For more information, please visit www.bbffamilyservices.org/cit.